Norwegian Cruise Line will invest $30 million to upgrade its only U.S.-flagged ship, the 2,124-passenger Pride of America. The vessel will begin a 14-day dry dock on March 23, 2013, in Honolulu, where the ship is based, for a major makeover that will include the addition of luxury suites, studio cabins for solo cruisers, and two specialty restaurants. "As the only large US-flagged cruise ship, Pride of America offers a unique and extraordinary vacation to four of Hawaii's most popular islands," stated Kevin Sheehan, Norwegian's CEO. "We want to ensure that we are continuing to enhance the guest experience on this one-of-a-kind vessel." 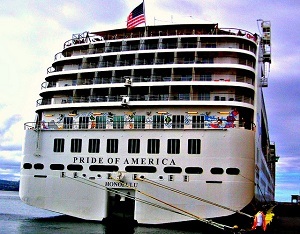 The Pride of America, which entered service in 2005, will exit the dry dock with 24 new ultra-luxury suites; four new studio cabins and four new inside cabins; Moderno Churrascaria, the line's Brazilian-style steakhouse; and Norwegian's signature steakhouse, Cagney's, which will replace the vessel's Lazy J's Steakhouse. Two of the 24 suites on Deck 13 will be 566-square-foot Deluxe Owners Suites that will sleep up to four guests, and feature a large bedroom and separate living area. The remaining Family Suites will range from 363 to 416 square feet, most sleeping up to six guests. A highlight of the suites will be their balconies, which will range from 245 square feet for Family Suites to 410 square feet for the Deluxe Owners Suites, giving Pride of America the largest balconies in the Norwegian fleet. The line's popular studio cabins, which made their debut on the Norwegian Epic, are designed and priced for solo travelers, and feature a full-size bed, and a small but separate bathroom area. The ship also will be given wireless Internet throughout, new carpeting, flat-screen televisions in all cabins, upgrades to the fitness center, new directional signage and renovations to the gift shop, photo gallery and art gallery. The Pride of America will return to its seven-day Hawaii itinerary from Honolulu in early April 2013.